Some application forms packages include two budget forms - (1) R&R Budget Form; and; (2) the PHS 398 Modular Budget Form. Include only one of these forms, but not both, in your application. Generally, the PHS 398 Modular Budget Form is applicable only to research applications from domestic organizations that are requesting $250,000 or less per budget period in direct costs, but there are exceptions. Refer to your specific FOA and these instructions for guidance on which budget form(s) to use. Who should use the PHS 398 Modular Budget Form? There are two primary types of Budget Forms: the detailed R&R and PHS 398 modular. Generally, you must use the PHS Modular Budget Form if you are submitting a research grant application from a domestic organization and you are applying for $250,000 or less per budget period in direct costs. You must use the R&R Budget Form if you are applying for more than $250,000 per budget period in direct costs. However, there are exceptions and other distinctions. Refer to your FOA and to the following instructions for guidance on which Budget Form to use. Special Instructions for Foreign Organizations (Non-domestic [non-U.S. Entities]): Foreign organizations must use the R&R Budget Form in G.300 - R&R Budget Form. Note that the terms "detailed budget" and "R&R Budget" are used interchangeably. For more information on how to prepare your budget, see NIH's Develop Your Budget page. Also see NIH's Modular Research Grant Applications page. Modular budgets are simplified; therefore, detailed categorical information is not to be submitted with the application. For all modular budgets, request total direct costs (in modules of $25,000), reflecting appropriate support for the project. There will be no future year escalations. A typical modular grant application will request the same number of modules in each budget period. Provide an additional narrative budget justification (in the Additional Narrative Justification section) for any variation in the number of modules requested. Prior to award, NIH may request additional budget justification in exceptional circumstances. 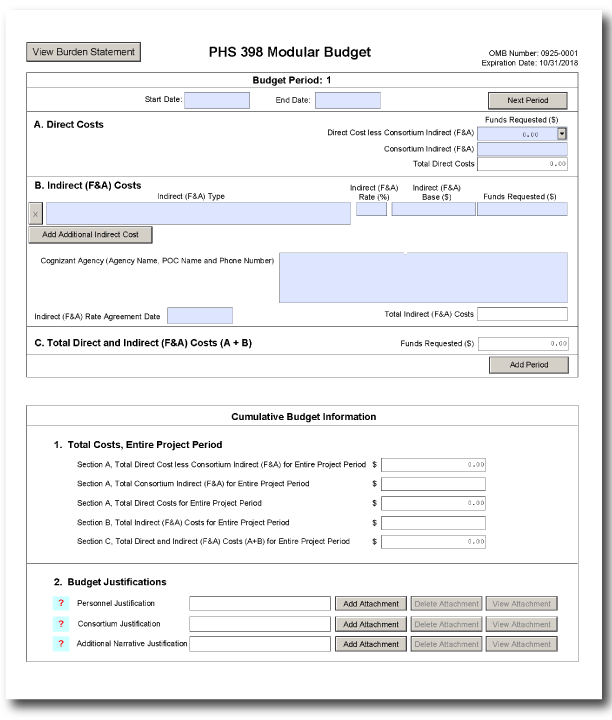 The Modular Budget Form provides budget fields for up to 5 periods of support (e.g., Budget Periods 1 - 5). A budget period is typically 1 year of support. If requesting fewer than 5 periods/years of support, complete only the applicable budget periods and leave the others blank. The fields are the same for all budget periods. The form will generate information for the Cumulative Budget Information section, which reflects information for the total project period. The following instructions (under "Budget Period 1") can be used for each Budget Period (1-5). This field is required. Enter the requested/proposed start date of the budget period. Use the following format: MM/DD/YYYY. For period 1, the start date is typically the same date as the Proposed Project Start Date on the SF 424 (R&R) Form. This field is required. Enter the requested/proposed end date of the budget period. Use the following format: MM/DD/YYYY. Enter the amount of direct costs, but do not include actual consortium indirect (F&A) costs. This figure must be in $25,000 increments, and it may not exceed $250,000 in a budget period. See the NIH Glossary's definitions of Direct Cost and Indirect Cost. If this project involves a subaward/consortium, enter the actual consortium indirect (F&A) costs for the budget period. If this project does not involve a subaward/consortium, leave the field blank. This field will be automatically calculated based on the sum of the "Direct Cost less Consortium Indirect (F&A)" and "Consortium Indirect (F&A)" fields. Indirect costs (Facilities & Administrative [F&A] costs) are defined as costs that are incurred by a grantee for common or joint objectives and that, therefore, cannot be identified specifically with a particular project or program. See the NIH Glossary's definition of Indirect Costs. You are encouraged to visit the following Defense Finance and Accounting Services (DFAS) Websites or call DFAS staff at 301-496-2444 for guidance: Main DFAS website, DFAS Frequently Asked Questions. The following website has a listing of unallowable and unallocable costs and the related Federal Acquisition Regulation (FAR) citation for each: NIH Office of Management's Unallowable/Unallocated costs. Refer to the NIH Grants Policy Statement, Section 7.4: Reimbursement of Facilities and Administrative Costs for more information. Enter the type/base of indirect cost (e.g., Salary & Wages, Modified Total Direct Costs) and whether the cost is off-site. If more than one rate or base is involved for a given type of indirect cost, then list them as separate entries. If you do not have a current indirect (F&A) rate(s) approved by a federal agency, indicate "None-will negotiate" and include information for a proposed rate. Use the Budget Justification if additional space is needed. Indicate the most recent Indirect (F&A) cost rate(s) established with the cognizant federal office, or in the case of for-profit organizations, the rate(s) established with the appropriate agency. If you have a cognizant/oversight agency and are selected for an award, you must submit your indirect rate proposal to the NIH awarding IC or to the PHS awarding office for approval. If you do not have a cognizant/oversight agency, contact the awarding agency. This field should be entered using a rate such as "55.5." Enter the amount of the base for each indirect cost type. Enter the funds requested for each indirect cost type. Enter the name of the cognizant Federal Agency and the name and phone number of the individual responsible for negotiating your rate (your point of contact). If no cognizant agency is known, enter "None." If you have a negotiated rate agreement, enter the agreement date. This field will be automatically calculated based on the sum of the "Funds Requested" fields from all of the Indirect (F&A) Costs. This field will be automatically calculated based on the sum of the "Total Direct Costs" and "Total Indirect (F&A) Costs" fields. All values for the "Total Costs, Entire Project Period" section are automatically calculated and the fields are pre-populated. They present the summations of the amounts you entered for each of the individual budget periods. Therefore, no data entry is allowed or required in the "Total Costs, Entire Project Period" section. If any of the amounts displayed in this "Total Costs, Entire Project Period" section appear to be incorrect, you may correct it by adjusting one or more of the values that contribute to that total. To make any such corrections, you will need to revisit the appropriate budget period form(s). Attach this information as a PDF file. See NIH's Format Attachments page. List all personnel, including names, percent effort (use the Person Months metric), and roles on the project. Do not provide individual salary information. You must use the current legislatively imposed salary limitation when estimating the number of modules. For guidance on current salary limitations, contact your office of sponsored programs. Administrative, Secretarial, and Clerical Support Salaries: In most circumstances, the salaries of administrative, secretarial, or clerical staff at educational institutions and nonprofit organizations are included as part of indirect costs. However, examples of situations where direct charging of these salaries may be appropriate may be found at 45 CFR 75.403. The costs are not also recovered as indirect costs. Requests for direct charging for administrative, secretarial, or clerical personnel must be appropriately justified here in the "Personnel Justification." For each individual classified as administrative/secretarial/clerical, provide the name; percent effort; role; and a justification documenting how they meet all four conditions. NIH ICs may request additional information for these positions in order to assess allowability. Graduate student compensation: NIH grants also limit compensation for graduate students. Compensation includes salary or wages, fringe benefits, and tuition remission. While actual institutional-based compensation should be requested and justified, this may be adjusted at the time of award. This limit should also be used when estimating the number of modules. For more guidance on this policy, see the NIH Guide Notice on Graduate Student Compensation. Attach this information as a PDF file. See the NIH's Format Attachment page. Provide an estimate of total consortium/subaward costs (direct costs plus indirect [F&A] costs) for each budget period, rounded to the nearest $1,000. List the individuals/organizations with whom consortium or contractual arrangements have been made and indicate whether the collaborating institution is foreign or domestic. Do not provide individual salary information. If the requested budget requires any additional justification (e.g, variations in the number of modules requested), save the information in a single file and attach this information as a PDF file. See NIH's Format Attachment page.